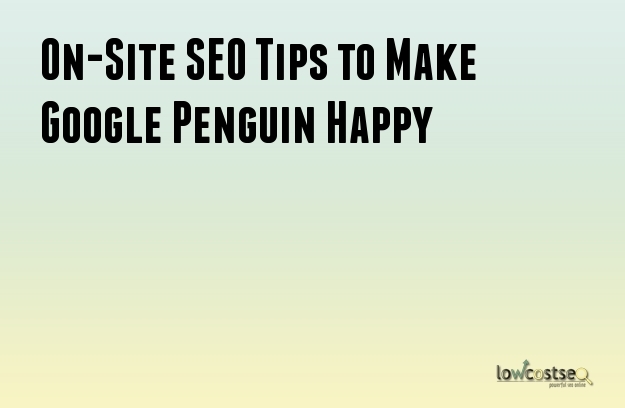 Those familiar with SEO will have undoubtedly heard of Google Penguin. For those who do not know already, the Penguin is not a mascot. Rather it is a codename for an algorithm used by the Google search engine. The Penguin algorithm is used by Google to fight spam and ensure that only websites free from spam gets ranked higher. If you wish to improve your on-site SEO, you will have to ensure that Google Penguin does not penalize you in the process. There are certainly some tips that can be of help in this regard. For your convenience, they have been divided into two sections. A title that is full of keywords needs to be avoided. Instead, you can use a descriptive title along with your brand name. The Meta Description should not contain keywords. The Meta Description is displayed below the link in a search results page and serves no SEO purpose whatsoever. A call to action will be interesting to the readers rather than keywords. Meta keywords have become more or less useless. Bypass the inclusion of your primary keywords in the H1 tags followed by the secondary ones in the H2, H3 tags and so on. You may include the keywords if they are sensible. Nonetheless, avoid wasting time and effort into making them fit. Moreover, keywords should never be implemented without adding extra words for context. The alt tags of images should not contain images. Rather a description should be used. There is no need to fill your URLs with keywords. Cloaking methodologies should be avoided. Keyword stuffing has become utterly useless in recent times. Poor content or content that has been duplicated should be eliminated. Do not repeat the same navigational links in the footer when they are already present in the header. Too much internal linking is not a good technique. Blogs should not be updated with content that has no value whatsoever. The website should be built for the users and not the search engine. The website architecture should be created according to SEO guidelines. Descriptive titles will lead to branding opportunities and shares on social networks. The Meta Description should be like a call to action. Exciting descriptions will increase the readership of your website. Create content that is geared towards the readers and users rather than the search engine. The User Interface, User Experience and Accessibility are primary elements and need to be considered while developing the website. Decrease the time it takes to load your webpages. Add social badges to increase the shares of your website. The content of the website should be friendly and useful. Uniqueness will be appreciated by Google Penguin. All facts in the website should be legitimate including the details of the company. Take appropriate steps and measures to decrease the bounce rate. Google Penguin is just one of the algorithms used by Google to determine the rankings of websites. If Penguin ever finds faults with your website, it will be penalized severely which can take weeks to repair.